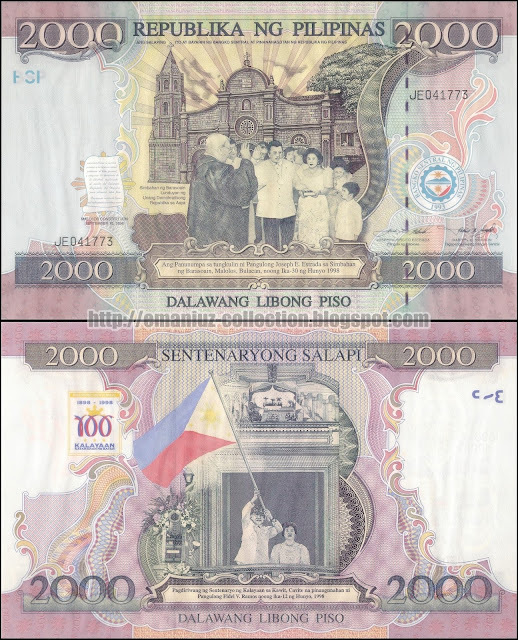 This is to certify that BSP issued only 300,000 pieces of this 216 mm x 133 mm 2,000 Piso centennial commemorative legal tender banknote. 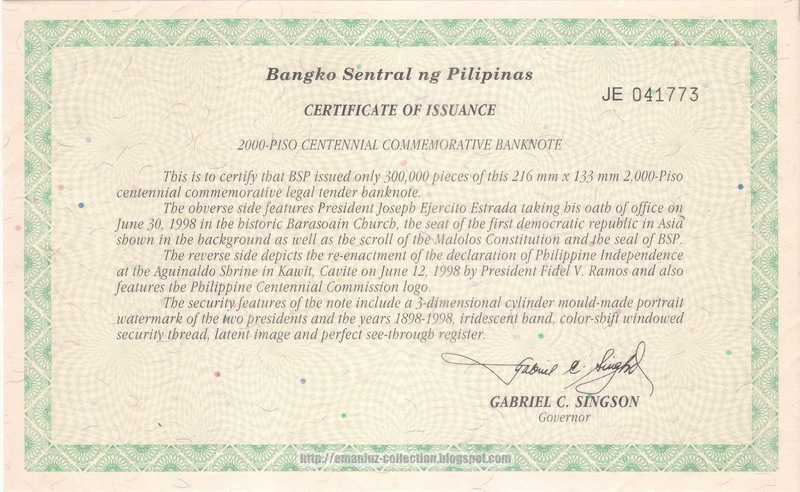 The obverse side features President Joseph Ejertcito Estrada taking oath of office on June 30, 1998 in the historic Barasoain Church, the set of the first democratic republic in Asia shown in the background as well as the scroll of the Malolos Constitution and the seal of BSP. The reverse side depicts the re-enactment of the declaration of Philippine Independence at the Aguilnaldo Shrine in Kawit. 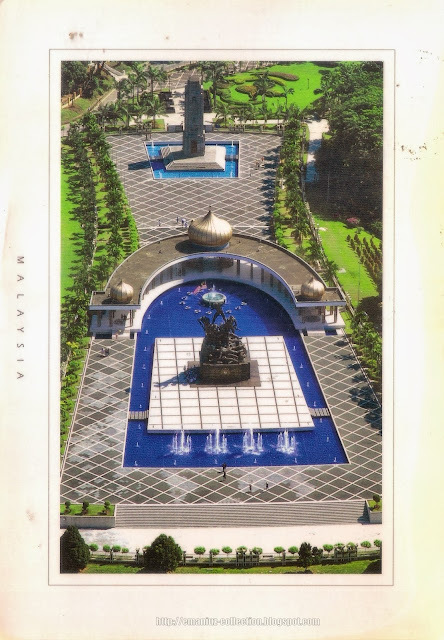 Cavite on June 12, 1998 by President Fidel V. Ramos and also features the Philippine Centennial Commission logo. The secutiry features of the note include a 3-dimensional cylinder mould-made portrait watermark of the two presidents and the years 1989-1998, iridescent band, color-shift windowed security thread, latent image and perfect see-though register. POSTCARD: The 15 meters National Monument in Lake Gardens, Kuala Lumpur near the Malaysian Houses of Parliament, is the world's tallest bronze freestanding sculpture grouping constructed in 1966 and designed by Austrian sculptor Felix de Weldon. It is dedicated to the fallen heroes who gave their lives during World War II and the Malayan Emergency (1948-60). 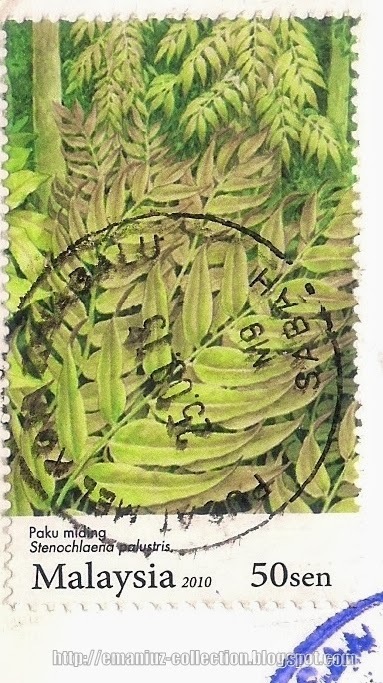 STAMP: Flora commemorative stamp featuring Ferns (Paku miding/Stenochlaena palustris) issued in 2010. Thanks to Junainah of Sabah, Malaysia! POSTCARD: A fascinating atmosphere in which to live or visit. Within the borders of the 26th state are contrasts of exciting, dynamic cities, culture and lighthouses with unspoiled wilderness and wildlife. Michigan, the Wolverine State, is the 26th state of US and the 9th most populous of the 50 states and 11th most extensive total area with the longest freshwater coastline of any political subdivision in the world. Michigan's state capital is Lansing and the largest city is Detroit. STAMP: Purple Heart commemorative stamp issued 2012 and the 2013 US Forever stamp featuring US Flag and "Where Dreams Blossom"
Thanks to Melissa of the United States of America! POSTCARD: The Schokland, a popular archeological site in Noordoostpolder, Province of Flevoland, is a former island reclaimed from the the sea in 1942. 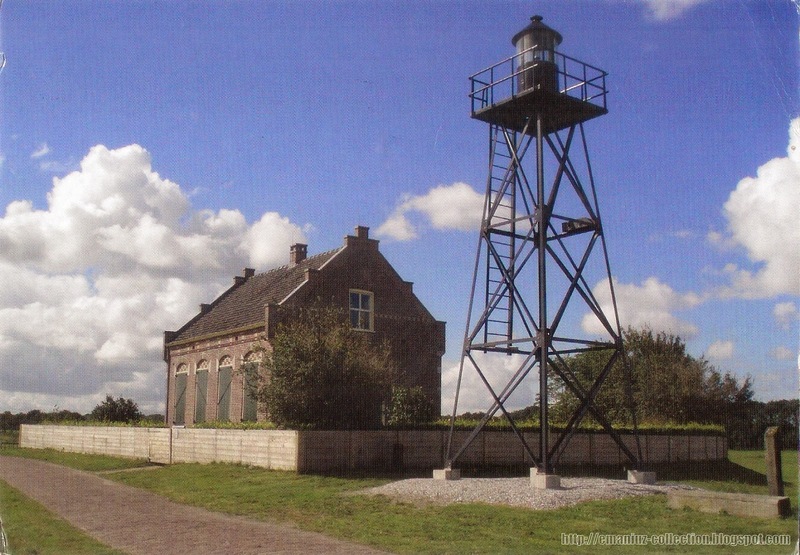 Schokland and Surroundings is the first UNESCO World Heritage Site in the Netherlands symbolizing the struggle of the people of Netherlands against the encroachment of the waters. 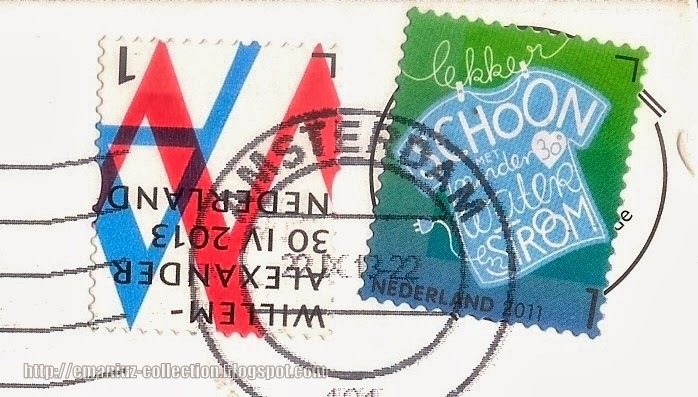 STAMPS: 2013 commemorative stamp of the inauguration of King Willem-Alexander and the 2011 Busy Green definitive stamp. Thanks to Mieke of Amsterdam, Netherlands! POSTCARD: Switzerland is a landlocked country in Western and Central Europe bordered by Germany, France, Italy, Austria and Liechtenstein. It is the birthplace of the Red Cross & Red Crescent Movement, and home to a large number of international organizations and large multinational corporations. 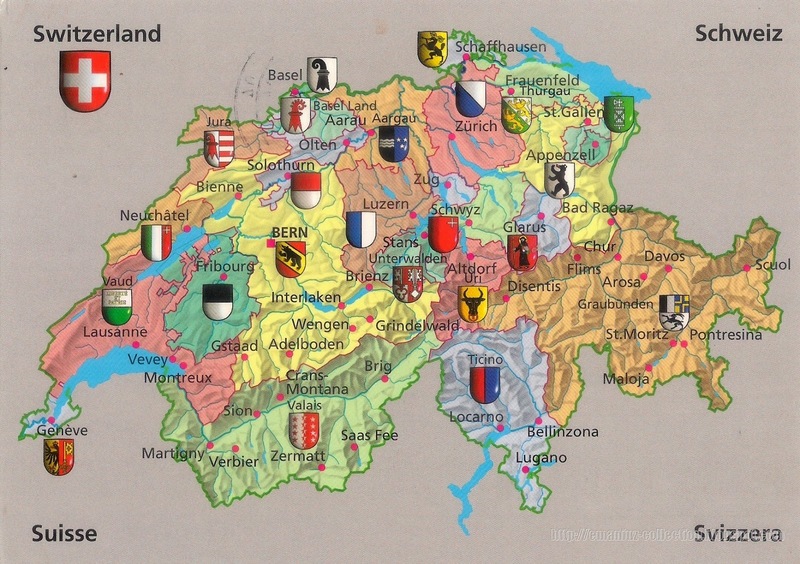 Switzerland's economy is stable and prosperous making it as one of the wealthiest/richest country in the world and has the highest wealth per adult of any country in the world. STAMPS: 2011 commemorative stamp with Alsfeld Town Hall (built 1512-1516) of Timber-framed buildings in Germany (II) series and the 2005 definitive stamps showing tagetes and tulpe (flower series). Thanks to Lothar of Germany! 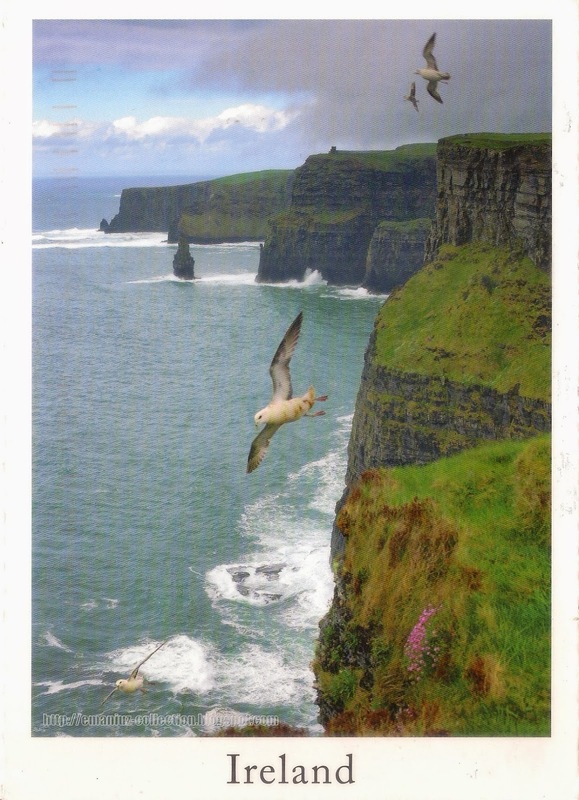 POSTCARD: "The beautiful Cliffs of Moher are a haven for seabirds and a place where people can regain a true perspective of heir place in nature." The 8 kilometers cliffs are standing 702 feet (at their highest point) in Burren Region, County Clare facing the Atlantic coast and and considered as Ireland's most visited natural spot attracting millions each year. Around 30,000 birds in 20 species are living on the cliffs. 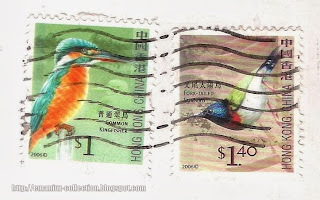 STAMP: Definitive stamp issued 2013 featuring the black-legged Kittiwake (Rissa tridactyla). Thanks to Crissybaby of Ireland! 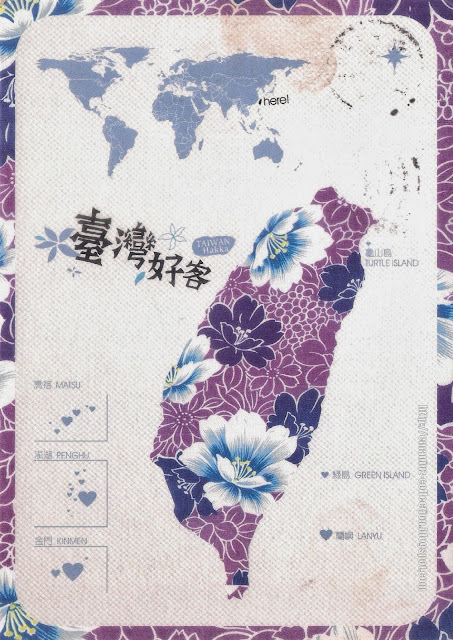 POSTCARD: Taiwan is a state in East Asia bordered by People's Republic of China, Japan and Philippines. 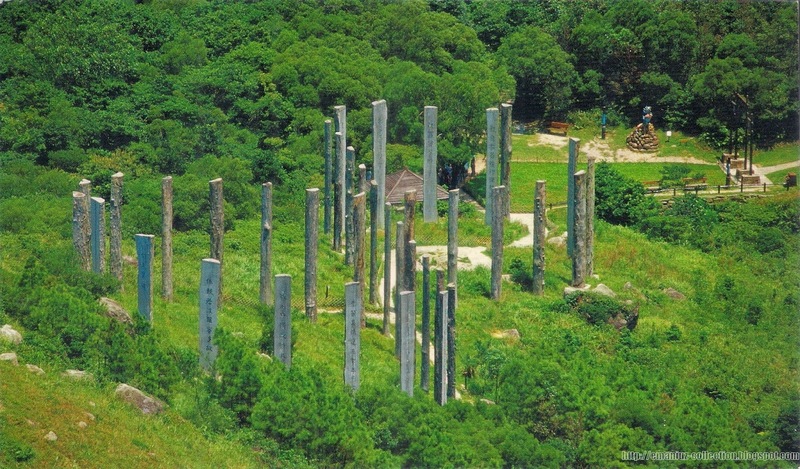 Taiwan, with Taipei as capital, is one of the Four Asian Tigers and a member of WTO and APEC. 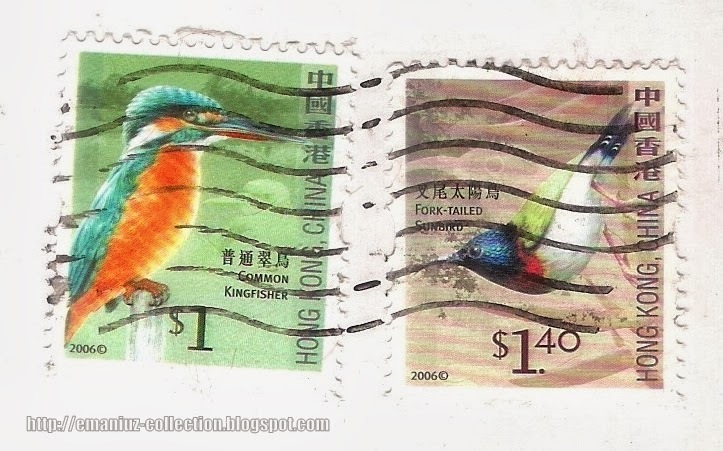 STAMPS: NT$5; 2013 Children at Play Stamp with children carrying lantern; 2013 Wild Mushrooms of Taiwan (III) stamp showing Morchella elata. Thanks to Rachel of Taiwan! TH-146468 / Travels 2,198 km (1,366 miles) in 15 days from Thailand to the Philippines. 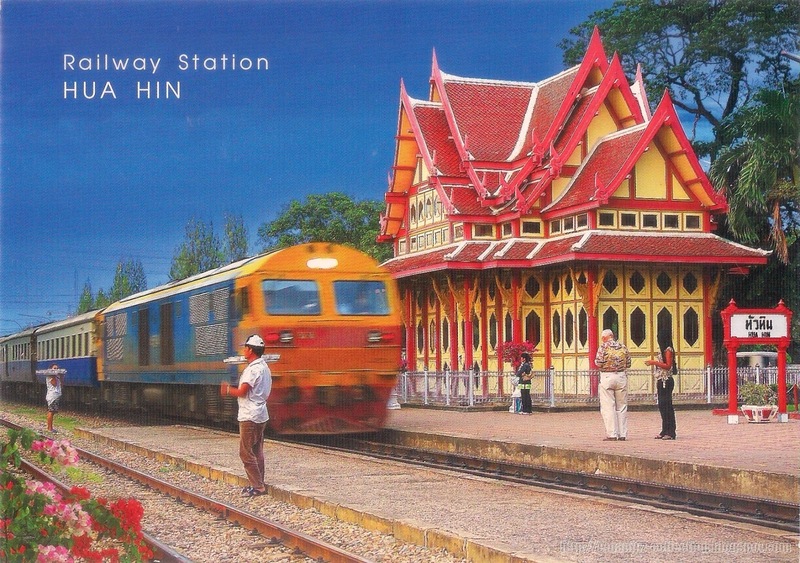 POSTCARD: Hua Hin Railway Station in Hua Hin, Prachuap Khiri Khan Province is the most beautiful and one of the oldest railway stations in Thailand. Built during the reign of King Rama VI, the wooden station used to be a royal pavilion in Sanam Chan Palace before its relocation and was rebuilt in 1968. The station was famous among local and foreign tourist because of its unique architecture. 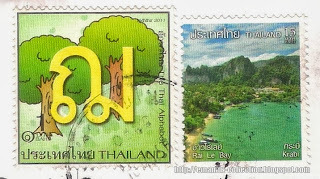 STAMPS: Definitive stamp issued 10-10-2010 showing King Bhumibol at 7฿ (Thai baht) and the National Children's Day 2013 Commemorative Stamp featuring cartoon figures wearing the national costumes of the 10 member countries. It is issued in 2013 in preparation for the ASEAN Economic Community (AEC) in 2015. Thanks to Jirat of Thailand! 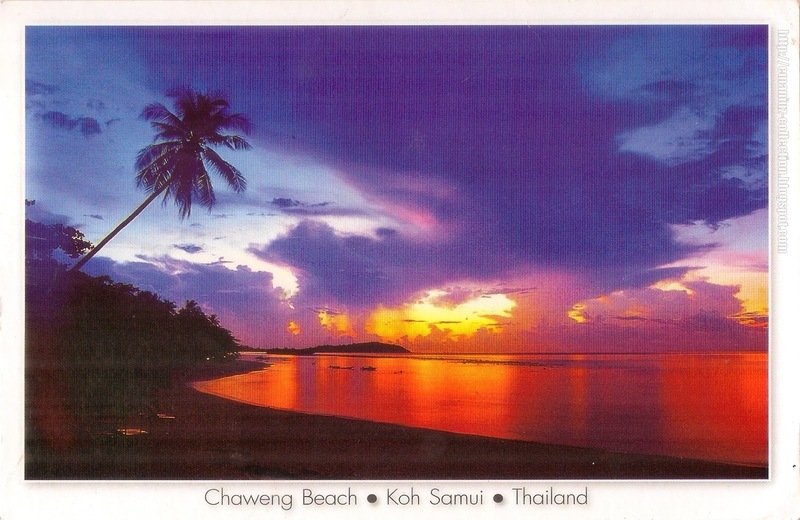 POSTCARD: A beautiful sunset at Yanui Beach, a bay in southern tip of Thailand's largest island and a popular tourist destination, Phuket Island. 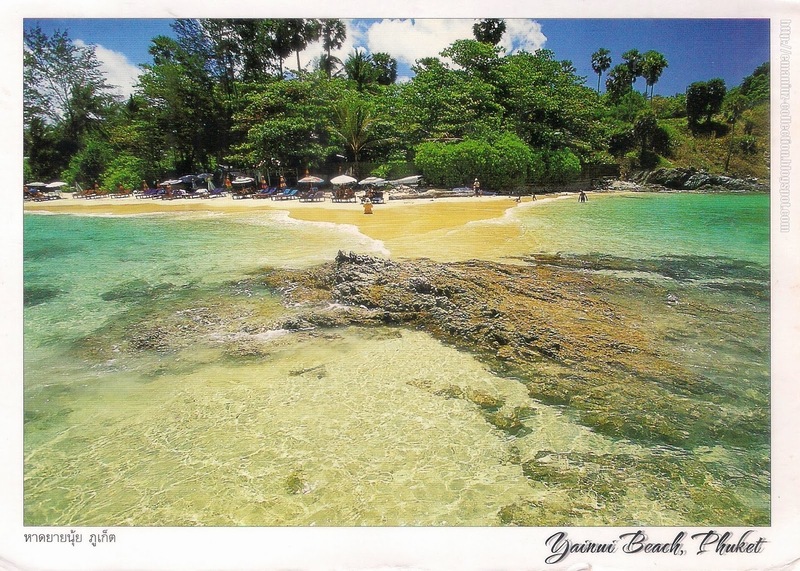 The small bay of Yainui lies between Nai Han and Lam Phromthep, a stunning view point. STAMPS: Important Buddhist Religious Day (Visak Day) 2013 Postage Stamp and Pre-eminent Protector of Arts and Crafts Postage Stamp featuring Her Majesty Queen Sirikit. Thanks to Lida of Russian Federation! POSTCARD: A long-tailed boat makes its way through floating market early morning at Damnernsaduak (Damnoen Saduak), part of the province Rajburi (Ratchaburi), Thailand. 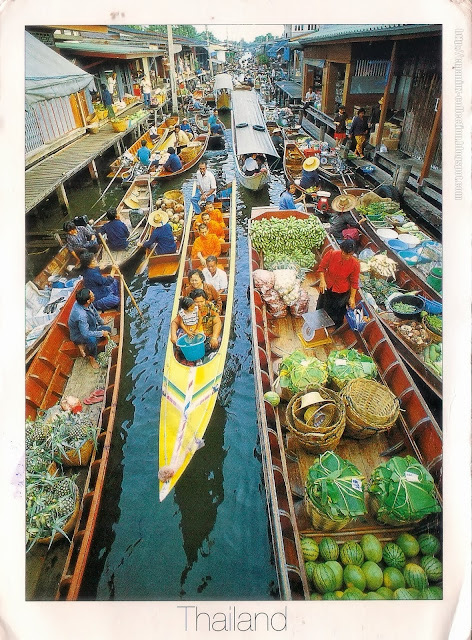 The market, about more than kilometers from Bangkok, is a popular among locals and foreign tourist. It is open at 8 am until 11 am. STAMPS: 2012 Thai Alphabet Postage stamp - Literature, Press and Comics (Calligraphy) at 1฿ and 2012 Seaside in Thailand series stamp showing Rai Le Bay at 15฿. 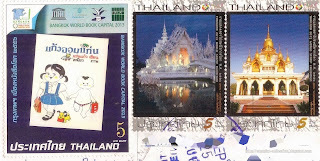 Thanks to Sue of Malaysia for sending me one during her vacation at Thailand!